So, today, the Moto Z2 Play was stealthily revealed — no fanfare, no red carpets, the phone just appeared. And that's not a huge surprise — the Play series is for midrange devices, which are rarely high-profile enough to warrant a lot of noise. But still, the Moto Play phones are awesome and have their own fanbase thanks to the value / price ratio that they have. And, with the Z2 Play, there are 4 new Moto Mods, which we think are pretty cool and need their own attention. So, let's check them one by one. Remember the good ole Style Shells that did nothing but just change the cosmetic appearance of your Moto Z's back side? Well, the new Style Shells come with fast wireless charging, so they are actually something more than a fresh pair of pants for your phone. Secondly, we have the new power banks, now named Turbopower Pack. What's the difference? 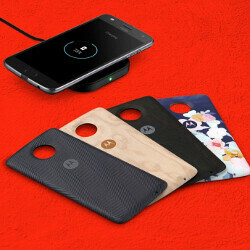 It now charges your Moto phone much faster. The Turbopower Pack has a 3,490 mAh capacity and charges the phone with 15 W of power. The JBL SoundBoost mod makes a return — the SoundBoost 2 is pretty much the same module, but now there is a special JBL app, which allows you to control over various settings so that you can tweak the sound to your own tastes. Last, but definitely not least, the new Moto GamePad is an awesome Moto Mod, which instantly transforms your Moto Z into a handheld gaming system. Developed with the assistance of Lenovo's gaming branch, it wraps around your phone snug and is equipped with its own 1,035 mAh battery. It's outfitted with two analog sticks, a D-pad, 4 buttons, and 2 triggers (shifts) — pretty much everything you'd need to comfortably play the games from the Play Store. The first 3 Mods will be available this July, while the GamePad is coming later... sometime "this Summer". The price for the new Style Shells is $39.99 a pop, the Turbopower Pack is $79.99, JBL SoundBoost 2 will cost $79.99, and the Moto GamePad will set you back another $79.99. Are you excited for the new Mods? The Moto Gamepad is something special. But you don't have mods to make it happen with other phone. Samsung already had a gaming console for their phones but no one used it. And yet this look great and maybe other OEM will put mods like this. Stolen idea from the challenge, nothing special. Can I use the Gamepad mod in old Z Play??? Yes, because all Moto Z phones have the same type of magnetic connection. The jbl speaker much nicer than the first one. I wouldn't mind having one of those on my Z Force.